Hundreds of residents of storm-battered and flooded eastern North Carolina took shelter at the William and Ida Friday Center for Continuing Education beginning the day after Hurricane Florence blew in at Wilmington. 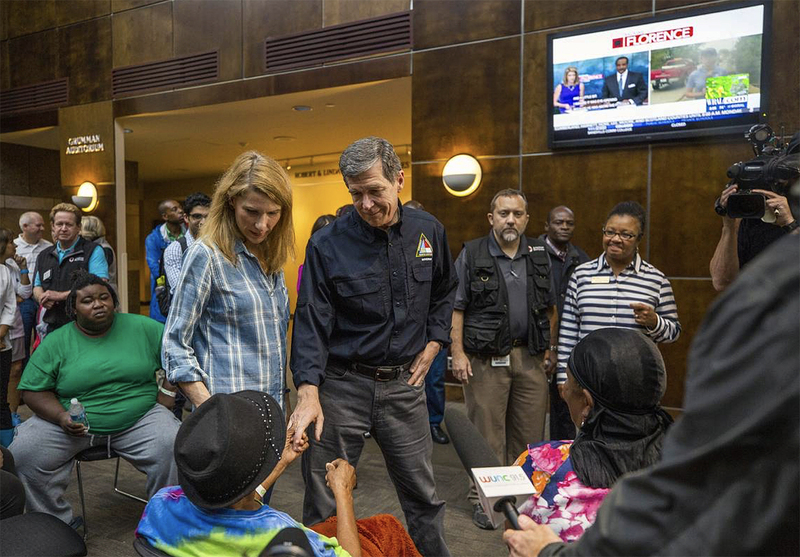 People forced out of their homes were bused to Chapel Hill by various county agencies, where they found cots, food, children’s activities and therapy dogs in the center’s large meeting rooms. Nearly 500 were in the shelter at the peak occupancy. The Friday Center is the centerpiece of a complex of education-related buildings on a site owned by the University about a mile east of the main campus. The University made it available to the state, which partnered with the American Red Cross and nursing and veterinary agencies to run the shelter. The GAA’s local Carolina Clubs are making Florence relief a priority for this year’s Tar Heel Service Day projects, Oct. 12-14. Van Horn was on her way out of town on Sep. 26, with fewer than 50 people remaining in the shelter as counties worked to get as many as possible closer to their homes. She said the personnel included UNC faculty who could speak Swahili who were asked to come in — news reports indicated some of those at the shelter were refugees from the Congo who had settled in the New Bern area, which was hit hard by the hurricane. The site included a shelter for small pets, and larger pets were sheltered elsewhere, Van Horn said. The Chapel Hill site was one of two large-scale shelters set up to accommodate those who found local shelters closing after the initial emergency. The other was in the Lawrence Joel Veterans Memorial Coliseum in Winston-Salem. Gov. Roy Cooper ’79 (’82 JD) met with evacuees at the Friday Center shelter two days after the storm hit. Costs of operating the shelter were shared among various agencies and the state, Van Horn said. She said she believed the Red Cross was primarily responsible for buying the food. The Friday Center planned to leave the shelter available as long as it was needed. The Carolina Center for Public Service coordinated aid efforts for the campus. • Help those affected by the storm in Native American communities such as the Coharie, Lumbee and Waccamaw Siouan tribes in southeastern North Carolina. On Sep. 27, the University announced a $2 million Florence Student Emergency Fund to provide support to students faced with unexpected financial hardships. The fund is part of a broader relief effort to assist students and families who were affected by the hurricane. The University will provide $1 million for the initiative from the University’s trademark licensing revenue and income from UNC Student Stores, in addition to funding that the University has already committed to need-based scholarships. The additional $1 million will be raised through a philanthropic match. The campus and the community can donate at giving.unc.edu/gift/relief. Carolina students who are experiencing financial hardship due to Hurricane Florence and wish to take advantage of the new fund should contact the Student Success Hub in Room 2416 at the Carolina Union or send an email to florence@unc.edu. The Hub contains specially trained teams who will work with students to develop individualized plans to meet their needs. 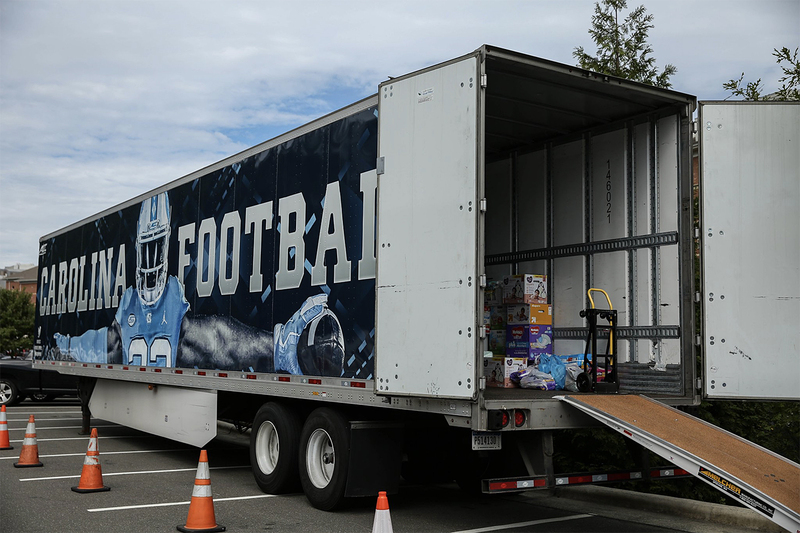 Early in the week after the hurricane came ashore, the football team began loading its 18-wheel equipment truck with relief supplies to the hardest-hit locations. Nonperishable food items and pop-top canned goods were accepted. In partnership with the Center for Public Service, undergraduate student volunteers worked to receive, load and sort the donations — by the second day, more than 300 cars had driven up to donate. Former Tar Heel linebacker Kevin Reddick Jr. ’13, from New Bern, started a GoFundMe campaign to help his hometown, and he asked Fedora for the football program’s support. Fedora discussed it with the team, and a spokesperson said each player donated his $15 daily meal stipend to Reddick’s cause. The truck left at the end of the week for Lumberton, with other locations to be determined along the way.